The secord part of John Rawls's lectures from 1984 on "Modern Political Philosophy" has now been published by the Harvard Philosophy Department. This part consists of 12 lectures (Lecture 12 - 23), which were delivered at Harvard University in the spring semester of 1984. John Stuart Mill (I). Utilitarianism. See John Rawls's "Lectures on the History of Political Philosophy" (Belknap Press, 2007) pp. 251-265, 270-271, 278. John Stuart Mill (II). Moral Rights. The Principle of Liberty. See John Rawls's "Lectures on the History of Political Philosophy" (Belknap Press, 2007) pp. 275-280, 284-293. John Stuart Mill (III). Mill's Doctrine as a Whole. See John Rawls's "Lectures on the History of Political Philosophy" (Belknap Press, 2007) pp. 290-293, 297-313. John Stuart Mill (IV). Free Institutions. The First Principle of Justice. See John Rawls's "Lectures on the History of Political Philosophy" (Belknap Press, 2007) pp. 297-313, and John Rawls's "Political Liberalism" (Columbia University Press, 1993), pp. 332ff. Four of the other lectures (Lecture 19 - 21) are on Karl Marx. New Book: "Transformations of Democracy"
Is democracy in crisis? On the one hand, it seems to be decaying under the leadership of political elites who make decisions behind closed doors. On the other hand, citizens are taking to the streets to firmly assert their political participation across the globe. Drawing on a range of theoretical and empirical perspectives, this collection examines the multiple transformations which both the practice and the idea of democracy are undergoing today. It starts by questioning whether there is a crisis of democracy, or if part of this crisis lies in the inadequacy of social and political theory to describe current challenges. Exploring a range of violent and non-violent forms of resistance, the book goes on to ask how these are related to the arts, what form of civility they require and whether they undermine the functioning of institutions. 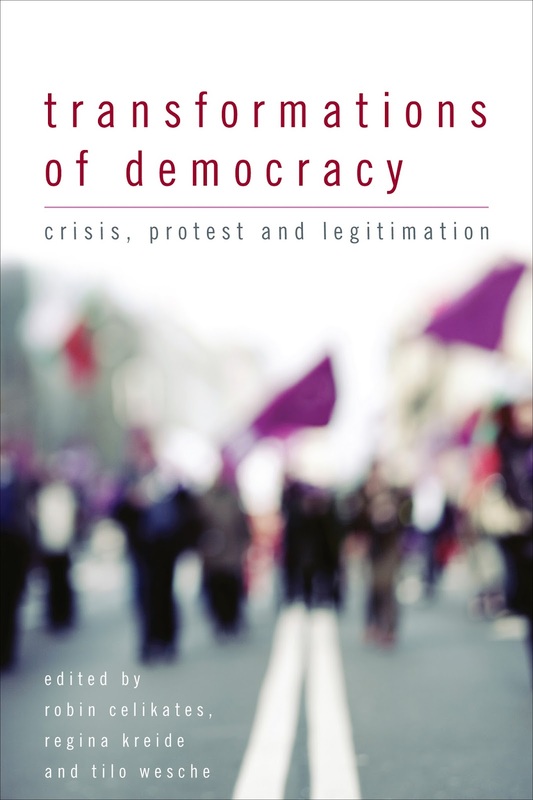 In the final section of the book, the contributors examine the normative foundations of democratic practices and institutions, especially with regard to the tension between human rights and democracy and the special character of democratic authority. Part I: Democracy in Crisis? Part III: Democracy Revisited: New Normative Foundations for Democracy? "My dissertation is an exegetical, reconstructive and critical project on Jürgen Habermas' recent account of the role of religion in the public sphere. It is an exegetical dissertation insofar as it interprets Habermas' account as presented in his article Religion in the Public Sphere. It is reconstructive since it develops an analysis of Habermas' previous works as well as his new thoughts related to the key concepts involved in his argument. Finally, it is critical because it offers as well, based on the previous exegesis and reconstruction, a critical perspective of some of the weakness and deficiencies of Habermas' account. Among the potential philosophical contributions that I attempted to obtain with the development of my project I count, at least, the following. First, by developing a philosophical-political analysis of the relevance of religion, I hope to be able to problematize, from a Habermasian perspective, questions like (and related to) the following: Do my epistemic beliefs or attitudes toward religion condition my belonging to a democratic-political community? Second, my dissertation will offer an integral and systematic interpretation of Habermas' work hoping to provide solid basis to understand his recent approach on religion. Clearly, an integral interpretation is in a better position to assess, and produce, fair critiques of any philosophical perspective, in this case, Habermas' account of the role of religion in the public sphere. As a consequence, thirdly, I expect my dissertation to produce enough conceptual tools to develop a critique of Habermas' view. This critique, to be sure, will refer to the main conceptual foundations of Habermas' account. Nevertheless, it will also be especially applied to Habermas' argument on liberal eugenics and PGD (preimplantation genetic diagnosis); an argument that, in fact, he presents as a case in point for understanding the potential contribution of religious doctrines for public debates within a democratic society." Jürgen Habermas and Charles Taylor will share the prestigious $1.5 million John W. Kluge Prize 2015 for Achievement in the Study of Humanity awarded by the Library of Congress. See the press release from the Library of Congress here. Jürgen Habermas is one the world's most important living philosophers. His contributions to philosophy and the social sciences have gained world-wide influence, and for a half-century he has acted as a public conscience of the German nation and Europe as a whole. Translated into more than 40 languages, his work has contributed to epistemology, philosophy of language, philosophy of religion, democractic theory, jurisprudence and social theory. He has written and co-authored hundreds of books, articles, papers, speeches and chapters, and is widely read and cited both inside academia and beyond it. Charles Taylor is one of the most prominent, influential and powerful active philosophers on the world stage. Best known for his contributions to political philosophy, the philosophy of social science, the history of philosophy and intellectual history, his work has received international acclaim and has influenced academia and the world at-large. Published in 20 languages, his writings link disparate academic disciplines and range from reflections on artificial intelligence to analyses of contemporary multicultural societies to the study of religion and what it means to live in a secular age. A ceremony will be held on September 29 in Washington. Among the previous prize winners are Leszek Kolakowski and Paul Ricoeur. Interview with Nancy Fraser on "Transnationalization the Public Sphere"
Interview with Nancy Fraser (audio, 1 hour). The interview covers the history and formation of public sphere theory, the currents and forces in the "postnational constellation" that demands its rethinking, critical theory, what normative legitimacy and political efficacy look like on the transnational scale. See my post on Nancy Fraser's book here. The first chapter is available here. See also this interview with Nancy Fraser in "Eurozine": An astonishing time of great boldness (pdf). "Die Reaktion der deutschen Regierung war schändlich"
The interview was conducted by Odile Benyahia-Kouider. Q: Meinungsumfragen zeigen, dass eine deutliche Mehrheit der Deutschen den Positionen der Bundesregierung von Angela Merkel zustimmt, obwohl die Verhandlungen für Griechenlands Regierung erniedrigend waren. Bedeutet das, die Deutschen haben an Europa als einem politischen Projekt kein Interesse mehr? A: Was erwarten Sie von einer Bevölkerung, die von ihren Regierungen nie ernsthaft mit europäischen Fragen konfrontiert worden ist? Bei uns gibt es ein Sprichwort: Wie man in den Wald hineinruft, so schallt es heraus. Die Europapolitik, die von Anbeginn über die Köpfe unserer Bevölkerungen hinweg betrieben worden ist, ist das Paradebeispiel für den allgemeinen Trend einer Austrocknung der politischen Öffentlichkeit. Regierungen, die ihre Wähler eher einlullen als aufscheuchen möchten, werden von einer Presse unterstützt, die lieber Kunden betreut statt Konflikte aufzugreifen und aufzuklären. Die deutschen Wähler haben von der Krisenpolitik der letzten Jahre Schlagworte wie "Solidarität gegen Solidität" im Ohr. Ihnen ist das Gefühl gegeben worden, dass sie die Kanzlerin, die ihr Geld zusammenhält, nur machen lassen sollen. Die CDU hat die sogenannte "Transferunion" zum Schreckgespenst aufgeplustert; und jetzt haben alle Parteien Angst, diese selbstgebastelte Hürde zu nehmen. Bundeskanzlerin Angela Merkel hat soeben noch vor dem Bundestag ihr Mantra wiederholt: "Mit mir wird es keinen Schuldenschnitt geben". Dabei weiß sie so gut wie der IWF, dass eine zügige Rekonstruktion der griechischen Schulden ganz unvermeidlich ist. Statt ihren Wählern unangenehme politische Alternativen zu erklären, kaufen die politischen Eliten Zeit mit Milliardenkrediten. Lassen Sie mich auf Ihre Frage zurückkommen. Abgesehen davon, dass die verteufelten Transfers längst stattfinden, gibt es durchaus empirische Anhaltspunkte dafür, dass eine hartnäckige, informierte öffentliche Debatte über die Notwendigkeiten und die längerfristigen Vorteile einer gemeinsamen Fiskal-, Wirtschafts- und Sozialpolitik in Deutschland zu einem Meinungsumschwung führen können. Q: Hat diese griechische Krise gezeigt, dass die EU ohne politische Einheit nicht überleben wird? A: Ja, ohne die zusammenführenden Kräfte einer politischen Union werden unsere nationalen Wirtschaften weiter auseinanderdriften. Die europäische Währungsgemeinschaft ist zu heterogen zusammengesetzt. Wir können deshalb nur noch zurück- oder vorangehen. "Der Stillstand ist der Tod", sagt ein Filmtitel meines Freundes Alexander Kluge. Ich glaube, dass die Auflösung der Eurozone wohl nur als Konsequenz einer unbeabsichtigten Kettenreaktion eintreten könnte. Dann müsste gerade die Linke für das Zurück zum Nationalstaat einen hohen Preis zahlen. Denn ohne eine supranational handlungsfähige Euro-Union müsste sie jede Hoffnung auf eine politische Reregulierung der aus dem Ruder gelaufenen Finanzwirtschaft fahren lassen. Aber auch der andere Weg ist riskant. Starke Interessen zielen auf eine technokratische Banken-, Fiskal- und Wirtschaftsunion, die ohne demokratische Geräusche Marktimperative geräuschlos umsetzt. Daher wird alles darauf ankommen, dem Europäischen Parlament die gleichen Rechte einzuräumen wie dem Rat. Das funktioniert wiederum nur, wenn es gelingt, ein europaweites Parteiensystem aufzubauen und die Bevölkerungen selbst in einen politischen Prozess einzubeziehen, der bisher an ihnen vorbeiläuft. Vor wenigen Wochen haben der französische und der deutsche Wirtschaftsminister, Macron und Gabriel, ein Papier lanciert, das in dieser Hinsicht doch noch sehr ambivalent ist. Ein "europäischer Finanzminister" ist keine Lösung. See the French translation of the interview in "L'Obs": "La réaction abrupte de l'Allemagne a été indigne". See also Gregor Dotzauer's article on Habermas in "Der Tagesspiegel" (July 31, 2015): "Der deutsche Deutschen-Kritiker".